Select an item below to expand and view answers to our most frequent questions. How do I measure for a custom table pad? We have a few different ways you can go about this. The first and easiest method is to give us the manufacturer and look for the model number under your table (normally written in crayon). We keep thousands of these on file to ensure the table pad fits perfectly. The second method is to contact us and have one of our free measuring kits mailed to your home. The kit includes detailed instructions on how to measure for your table pad. 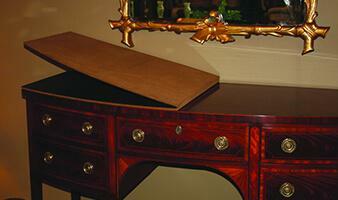 You can also head over to our how to measure your table page for more information. Why own a Berger Table Pad? The primary reason to own a table pad is to protect your property from potential damage. 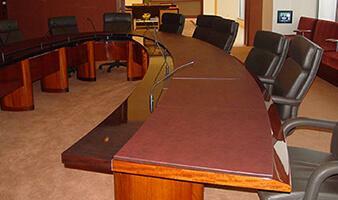 Dining tables, buffets, pianos and conference tables can easily cost many thousands of dollars. A pad is a proven and effective way to keep furniture looking brand new. The three most common problems people face are heat, scratches and spills. 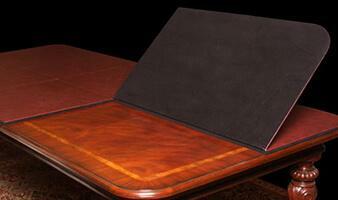 Our pads are designed to protect surfaces while still providing an elegant look to your fine furnishings. At Berger's we have built our reputation in the industry as "the finest table pads made" through our strict quality standards. Additionally, since we are the manufacturer we eliminate any retail markup and pass along the savings to our customers everyday. Learn about how our pads are made, here. Our pads consist of a solid, lightweight, fiberboard core that is basically unaffected by humidity and will not warp when standing upright. This definitely saves space. Because our pads are lighter than others, they are much easier to handle. They are unquestionably the world's best quality pads. Your 100% satisfaction is our #1 priority. 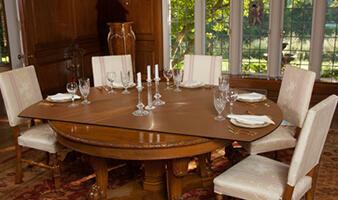 We have literally sold hundreds of thousands of table pads by phone and online over the years. The percentage of those that do not fit is astonishingly low! But we're all human. If we make the error, we guarantee to remake your pad at absolutely no additional cost. Keep in mind, table pads are custom made and upholstered, so we do allow ourselves a 3/16" tolerance in width, length, and shape when centered on your table. What information is needed to place a table pad order? Usually there is no need for you to do any type of measuring. Since we have over 20,000 table patterns on file all we need is for you to check the bottom of your furniture or the receipt for the manufacturer name and model number. If you don't have the model number information, we have available in-home representatives who will gladly come out at no charge and measure for you in most major markets. We also have phone support to help you do the measuring in just a few minutes. We keep a wide variety of color choices that are sure to fit your individual table and requirements. Visit our colors page to view these in detail. Remember, each computer monitor shows colors a bit differently, therefore, if you need a sample swatch you may request one here. What is the MagnaLoc™ magnetic locking system? 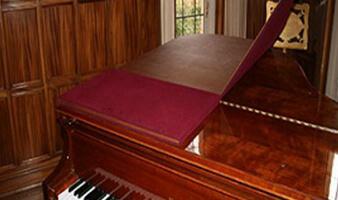 This is our patented system that helps keep the table pad sections from separating during normal use. Learn more about this exclusive system, here. How long does it take to get my pads? 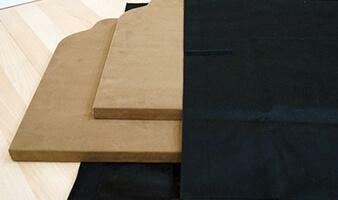 Since we manufacturer our pads in our plant we offer the fastest delivery in the industry. Normally from the time we receive the order it will take about 3-5 weeks to get delivered. If you have a special need and require expedited delivery simply ask our representative for help. 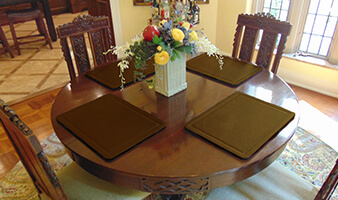 In addition to our 90-day workmanship guarantee, not including your own negligence or an act of nature, we will repair, reupholster, or replace table pads at no charge to you. As in any custom made product, we do not exchange or give refunds. 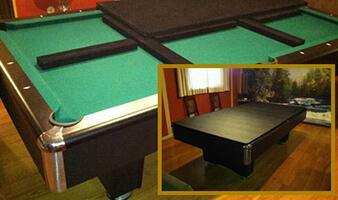 If you have a problem with the table pad you ordered - such as manufacturing defects, damage, etc. - you must contact us within 30 days at 1-800-305-7237. We will be more than happy to assist you with your table pad concerns. We guarantee to make it right if we made an error or if there is any shipping damage. 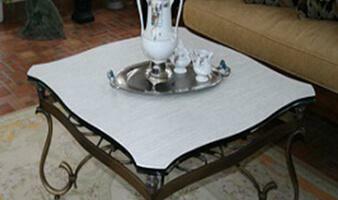 Table pad is excellent quality and fit perfectly! 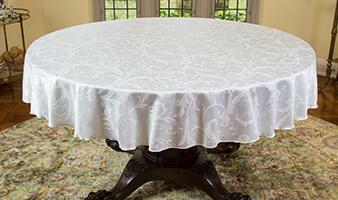 Same with the table cloths. Easy to order, wonderful customer service ... couldn't be more pleased! I high recommend them! I recently received my custom made table pads and they are perfect! The company is efficient and highly professional. Production and delivery time estimates were accurate. Could not be more pleased.